From the files of The Gazette October 20, 1994. 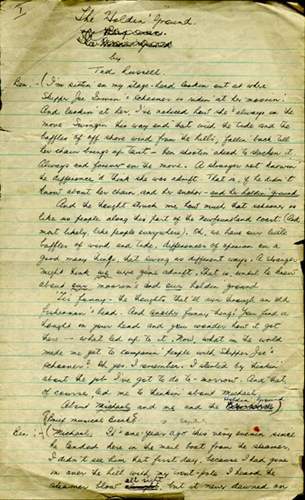 Courtesy of Archives and Special Collections (Coll - 089, 7.05), Memorial University of Newfoundland, St. John's, NL. Ted Russell was born in Coley's Point on June 27, 1904, and received his early education there and at Bishop Feild College in St. John's. In a time when any formal education in smaller Newfoundland communities was often a luxury, a person who had finished high school was deemed qualified to teach others. As a result, shortly after his graduation, at the age of 16, Ted Russell began a teaching career, which over the next 12 years took him to Pass Island, Harbour Breton, Millertown, Channel and Fogo. During part of that time (1928-29 and 1932-33) he attended Memorial University College (MUC). In 1933 he joined the staff of Bishop Feild College where he spent two years teaching. In 1935 he was appointed to the Newfoundland magistracy, and in the same year, he married Dora Oake and they had four daughters and one son. He served as magistrate at Springdale, Harbour Breton and Bonne Bay before becoming director of co-operatives with the Commission of Government in 1943. 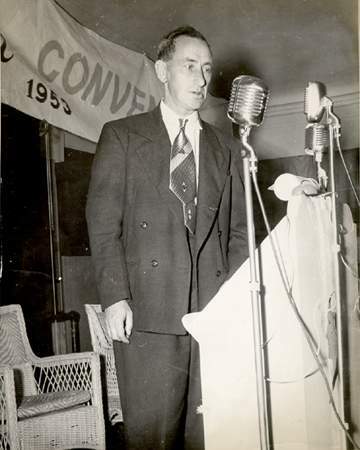 With the advent of Confederation in 1949, Russell resigned from the civil service, was elected to the new House of Assembly as Liberal member for Bonavista South and appointed to cabinet as minister of natural resources in the first administration of Premier J. R. Smallwood. It was a time of great change in Newfoundland. One of these changes was an attempt by the government to create a non-traditional industrial base with the establishment of such eclectic enterprises as a cement factory, a shoe factory, a glove factory, a chocolate factory, a battery plant and a host of others, some of which succeeded but most of which failed within a few years. Russell could only endure so much of what he considered to be a foolhardy and tragic waste of government revenues. On March 24, 1951, after finding he was unable to effect changes in the economic development policies from the inside, he resigned from cabinet. He sat as an independent member until a new election was held in November, one which he did not contest. After his escape from politics, Russell worked as an insurance agent until 1957 when he returned to teaching with a position at Prince of Wales College, St. John's. He left there in 1963 and at the age of 59 entered Memorial University where he finished the degree he had begun in 1928. Upon graduation he joined the faculty of Memorial's Department of English Language and Literature as a lecturer, retiring in 1973 with the rank of associate professor. He died at his home on Oct. 16, 1977. That Ted Russell found time in the midst of his other pursuits to write is surprising; that he found time to produce so much demonstrates his love of and commitment to writing. He had published a few short articles before 1953, but it was not until that year that he began to produce the extensive body of work known as "The Chronicles of Uncle Mose," which became a much anticipated and extremely popular feature on the Friday instalment of The Fishermen's Broadcast on CBC Radio. The six-minute serial, which Russell also read on air in the character of Uncle Mose, ran until 1962 during which time he wrote over 600 scripts. Between 1954 and 1957 he also wrote eight plays, all but one of which had the same setting as the "Chronicles" (Pigeon Inlet) and many of the familiar characters. The best known is probably The Holdin' Ground (1955); others include The Hangashore (1954), The Algebra Slippers (1955), and Groundswell (1956). Ted Russell wrote about the Newfoundland experience as he saw it. He is recognized as one of the first and foremost writers to use Newfoundland outport settings and characters as personifications of themes which, while appearing to be local, are actually universal in their scope and appeal. Courtesy of the Centre for Newfoundland Studies (Coll - 089, 2.04), Memorial University of Newfoundland, St. John's, NL. In 1986 Elizabeth Miller, Russell's daughter, on behalf of the Russell family, contacted the Centre for Newfoundland Studies with a view to depositing her father's papers in the archives. Arrangements were made to have the material formally transferred before the end of the year. It included the original scripts for approximately 350 of The Chronicles of Uncle Mose, mostly typewritten but some in Russell's handwriting. There were typed scripts for all eight of his radio plays, with handwritten copies of four: The Holdin' Ground, Spindrift, To God - Who Gave It and The King of the Cove. There were four scrapbooks documenting Russell's life from 1945 to 1960, another documenting the production of The Holdin' Ground at the 1956 Newfoundland Drama Festival, and a sixth containing reviews of his work. There was also assorted correspondence, student records from high school, MUC and MUN, some photographs and miscellaneous other items. This body of material is representative of Russell's writing in its original form. Together with four anthologies of the Pigeon Inlet stories and two plays which Dr. Miller has edited for publication, and her biography of him, they stand as a constant reminder of the literary legacy Ted Russell has left to us all.